Not bad for my first YouTube Live Event! Consider it was Easter Sunday night, still managed to have 17 viewers. It's hard talking to myself the whole time. 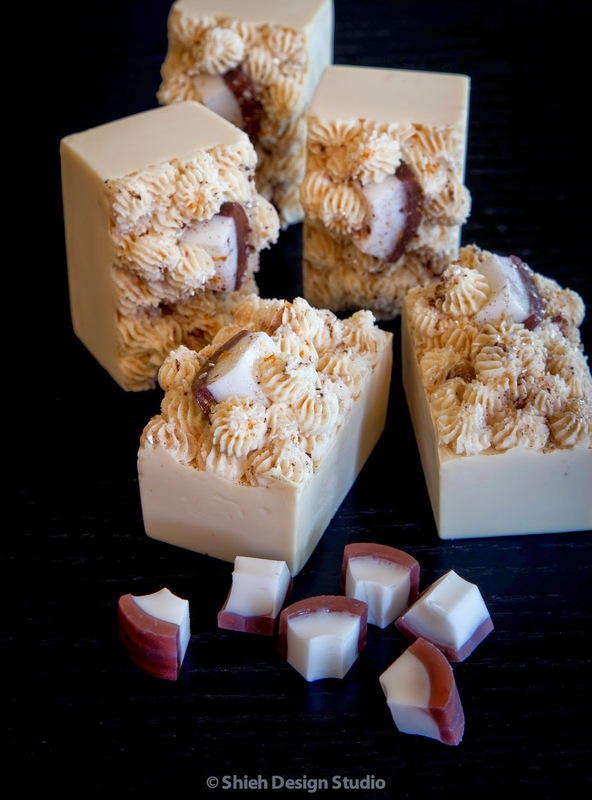 I usually soap pretty quiet and take my time "playing" with my soap. I was so conscious about giving the right amount of information at the same time trying not to soap faster to not bore viewers. Well, the hardest part is over, you will be the judge of how I did. Any constructive criticism welcome, please comment here or on my Facebook page. If it is well received I would really consider doing this with a regular schedule, what do you all think? I recently discovered YouTube has a live event you can activate, suddenly light bulb popped up in my head! I've tried Google hangout and Skype live soaping interactive sessions with not much of success mainly because it consumes too much internet band width from all parties participating. That was last year, there went my genius idea down the drain. Broadcasting soaping live is a compromise, I don't get to interact with anyone, it's like a one man show. It is not my ideal preference but I'm giving it a try. Please come watch me soap live on YouTube for the first time at 7:00 pm (Pacific Standard Time, I live in California USA) this Sunday, April 20th (yes it's Easter night) if you have time! 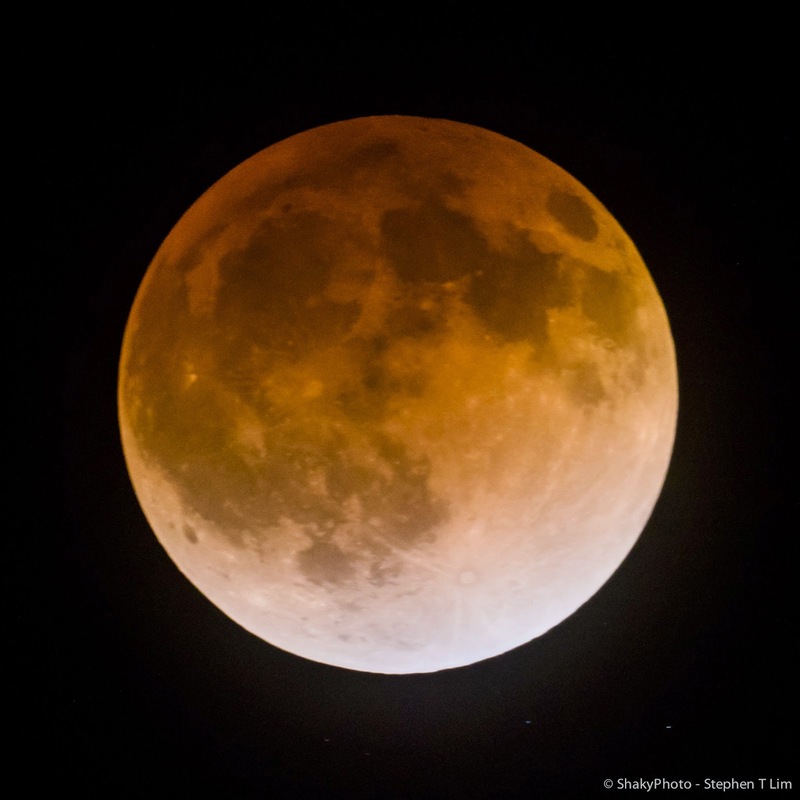 Inspired by the recent lunar eclipse event. 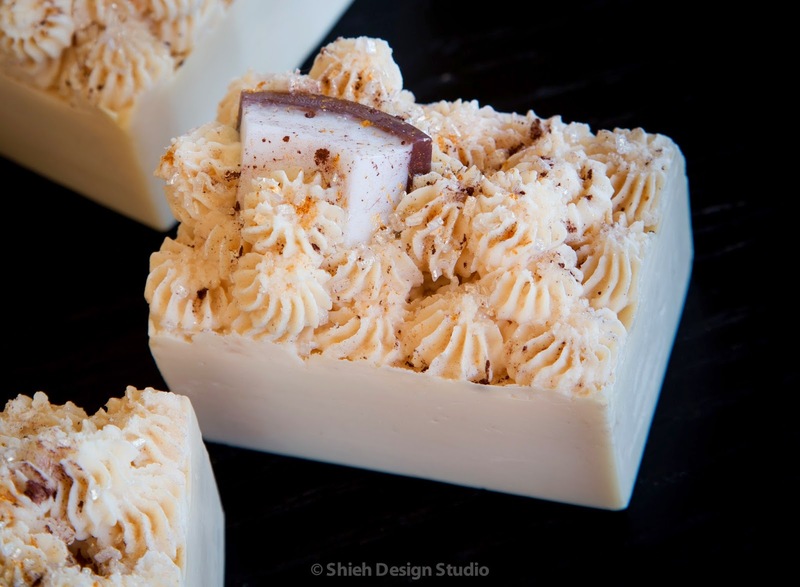 You have read this before from me that I seldom repeat my design, even if it's the same fragrance. But there are a couple I do every year that I consider worth keeping and repeat. However, the big concept might have stayed the same, it's the small detail changes that make each batch unique. 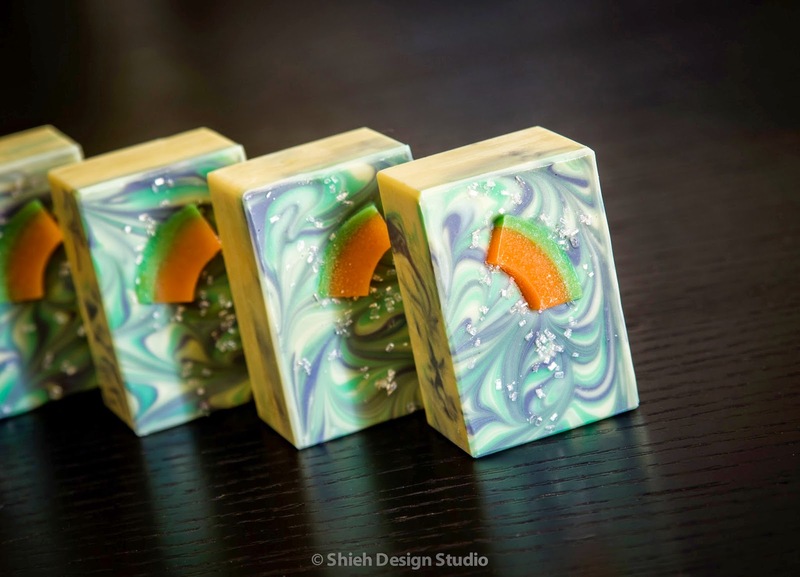 This is a story about how Mojito Soap evolved over the years. I feel like it is losing it's fame, time for a little reinventing! 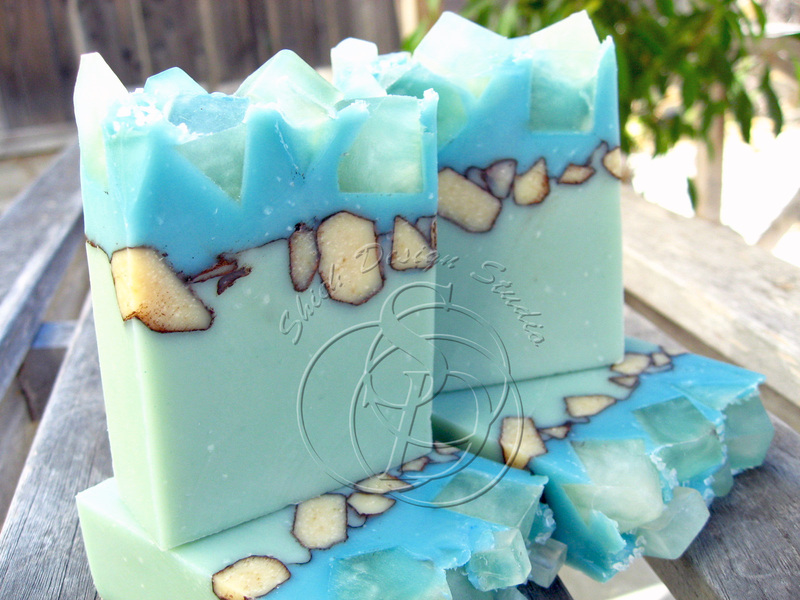 I went back to my original Mojito and really feel like I need to bring back some of the elements. I like the irregular rocks from the first generation rather than those later round balls. But instead of remaking the exact duplicate of first generation I want something else to catch people's attention again. Thanks to all that responded on my Facebook page and gave me some inspirations! 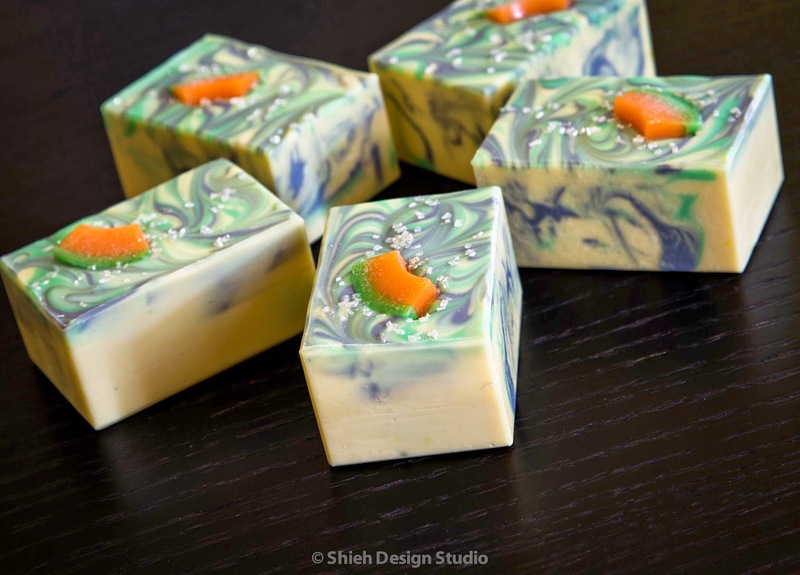 I'm rather excited about this new Mojito Soap, still made with coconut water and essential oil blend (instead of artificial fragrance), but a fresh look! 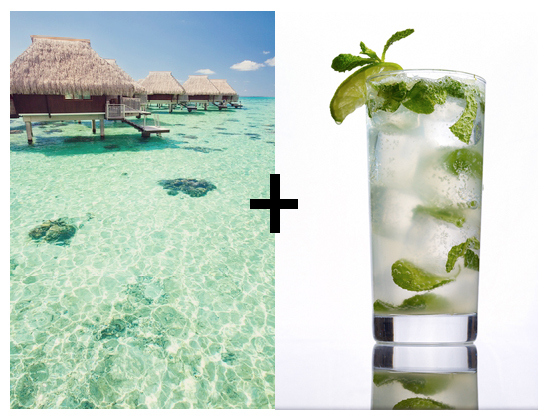 How can it call itself Mojito if there's no lime slices and mint leaves?! That's obvious, isn't it? 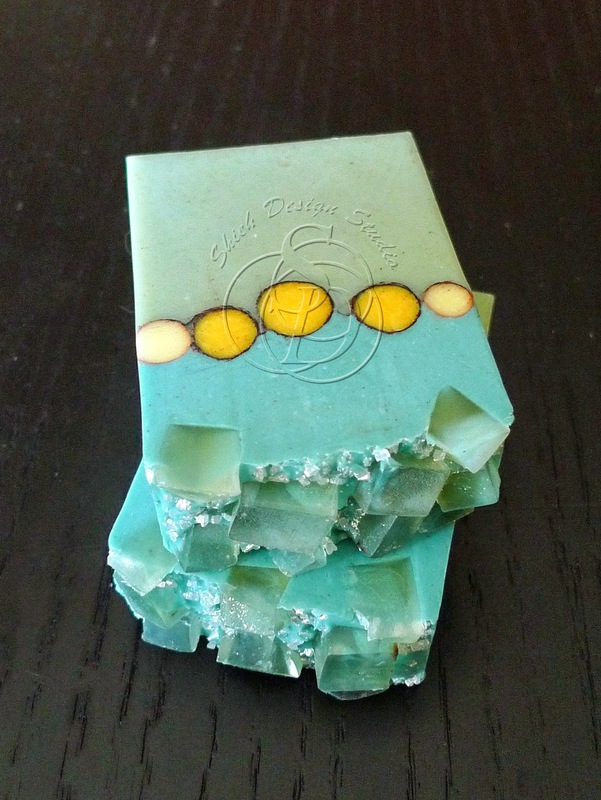 With a simple and free modification to my log mold I created this glass shape soap, how do you like it? 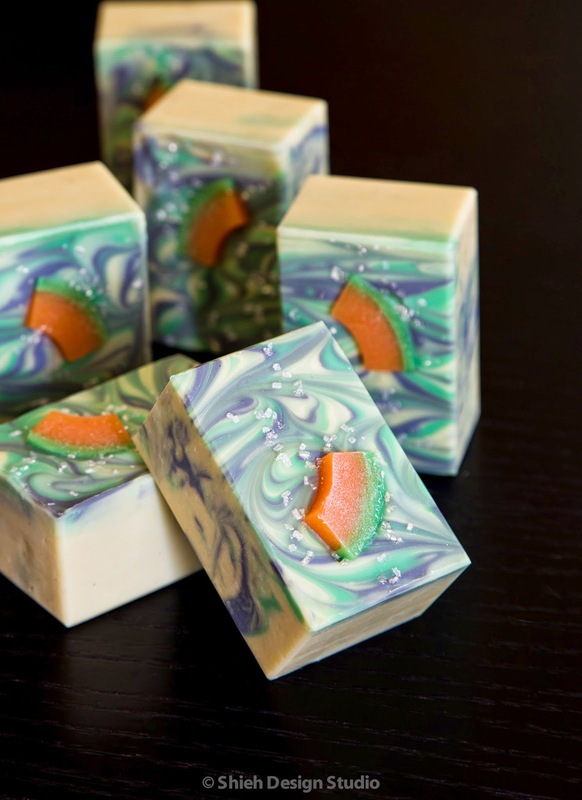 Simple soap embeds can be added inside the soap or on top of the soap, they can make an ordinary soap look interesting and instantly catch shoppers' attention. 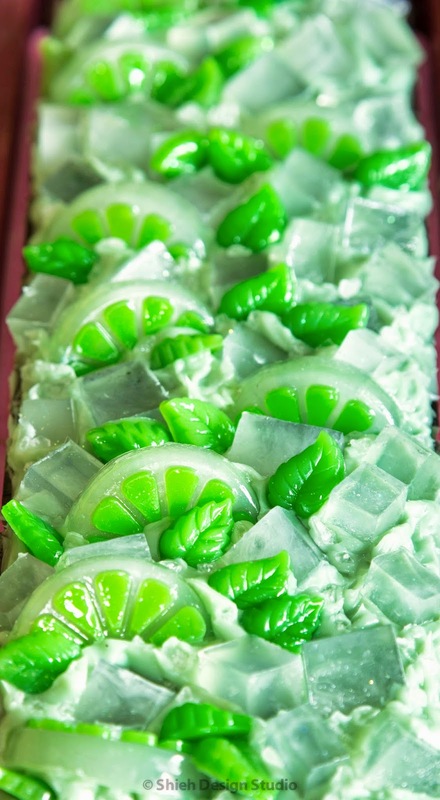 There are a lot of embed molds in the market, molds that meant to be used for making chocolate, ice cube, even cake fondant can be used to make soap embeds. 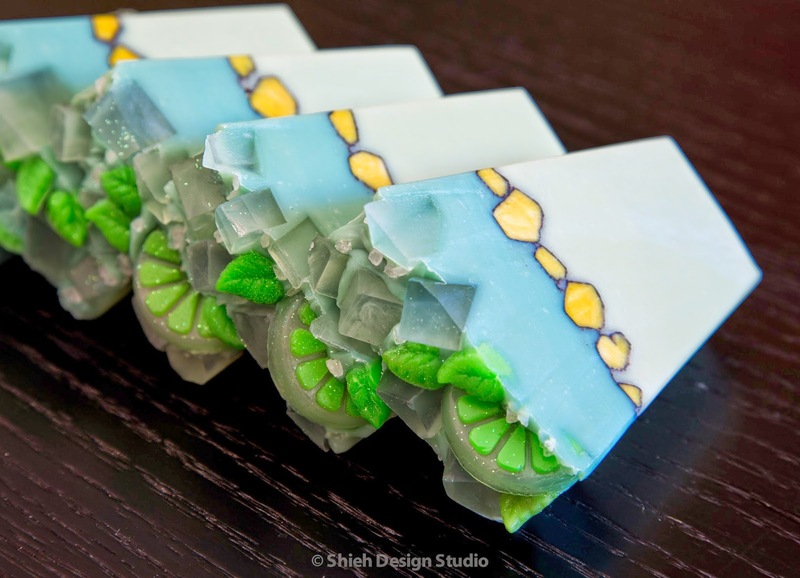 However, some intricate silicone molds can be very pricey! 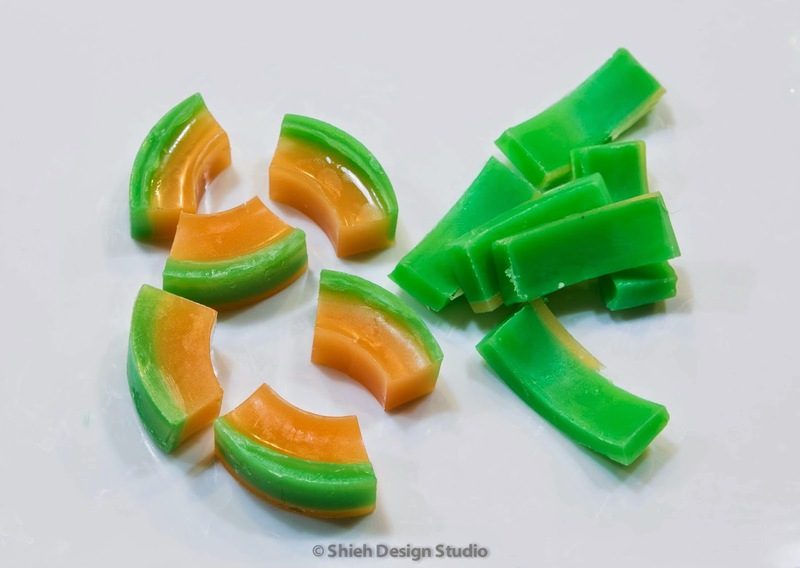 Here is a simple way to make fruit wedges without having to search for embed molds, like these tiny imitation of coconut wedges. 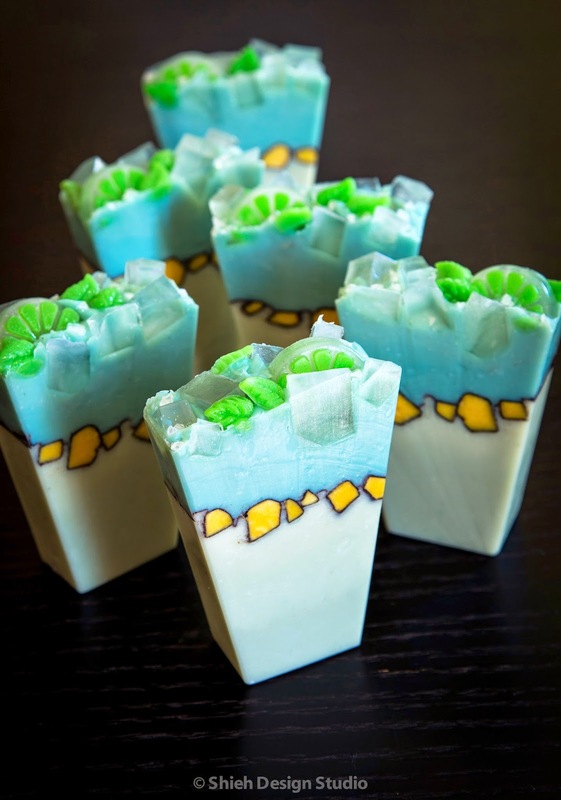 With the same technique, I made this tiny melon wedges for my Melon Spritzer Soap. This is actually very simple but do require patience. 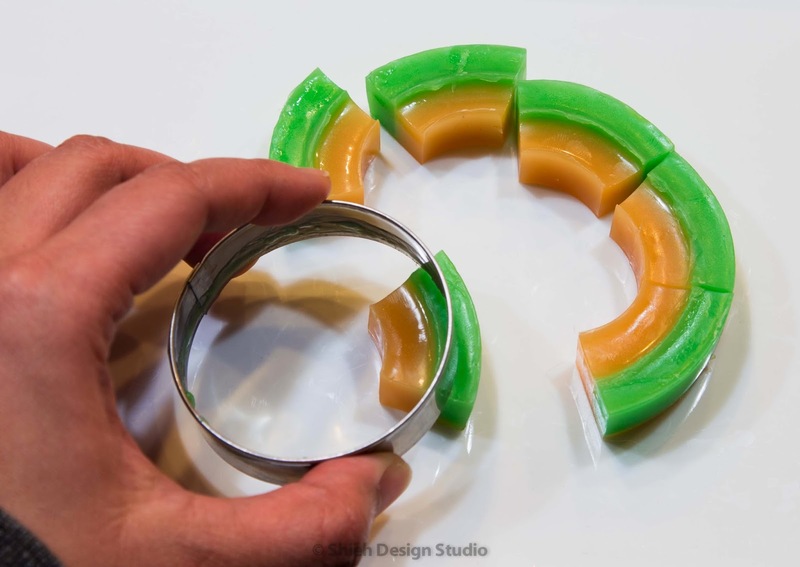 All you need is a round mold and circle cookie cutters. You can get a set of 3 circles for a few dollars in a typical kitchenware store. I only use the 2 larger ones. To demonstrate making melon wedges, step one, put the largest ring in a round mold. 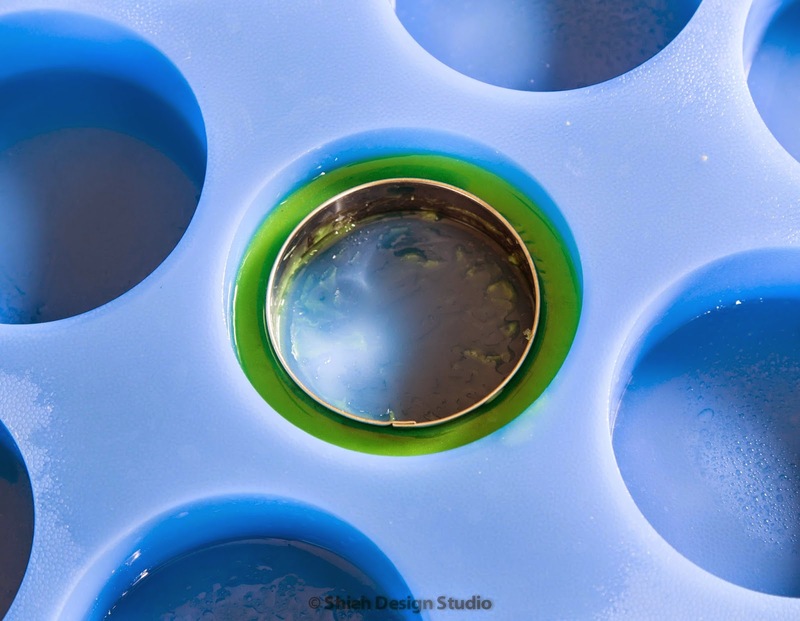 Mix up some melt & pour soap with green colorant then pour in between the space while holding down the ring with your fingers. 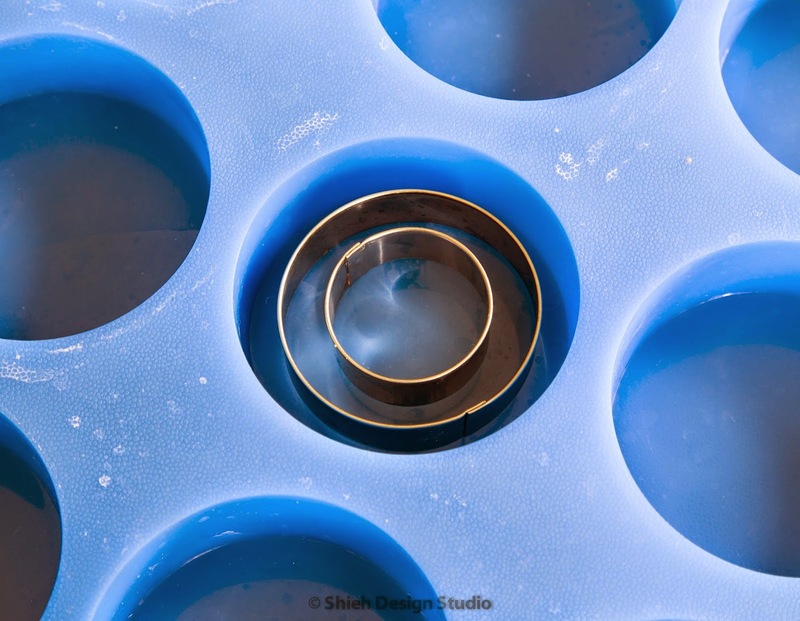 Let is cool down and unmold it to take off the largest cookie cutter ring. 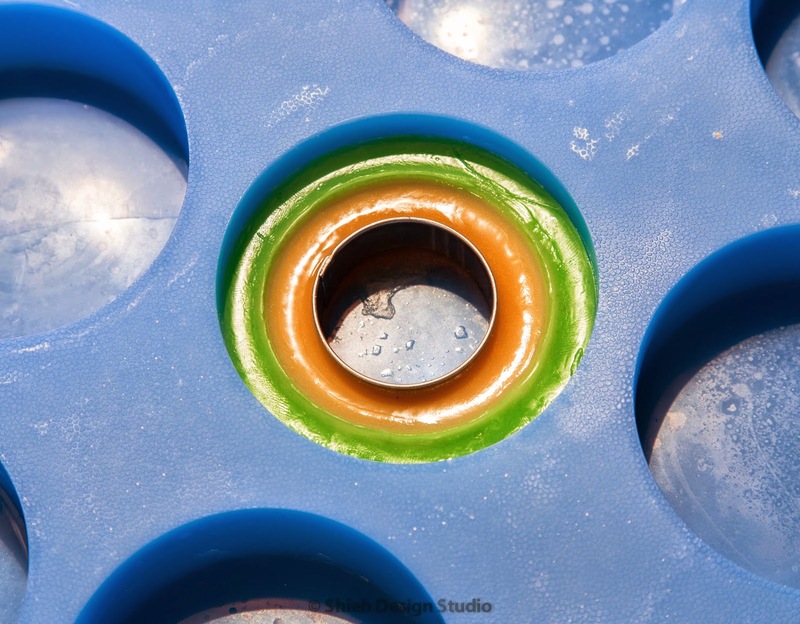 Put the green soap back into the mold, and place the medium size ring in the center. 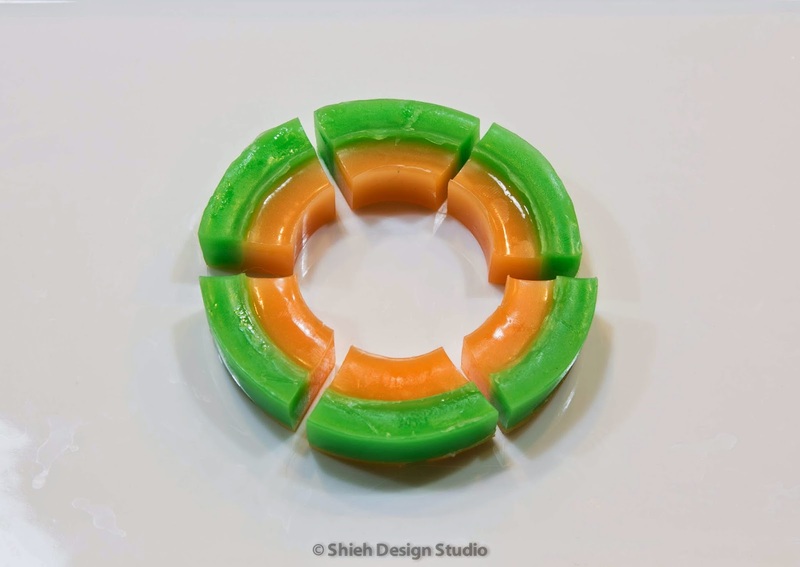 Mix up some melt & pour soap with orange colorant then pour between the green soap ring and the cookie cutter. Let it cool down, remove it from the mold and take off the cookie cutter. Use a knife to cut it into 6 wedges. The proportion between green and orange is just too equal, which is not realistic. To make it more like the real melon wedge, take the largest cookie cutter and cut off the outer green as much as you want. 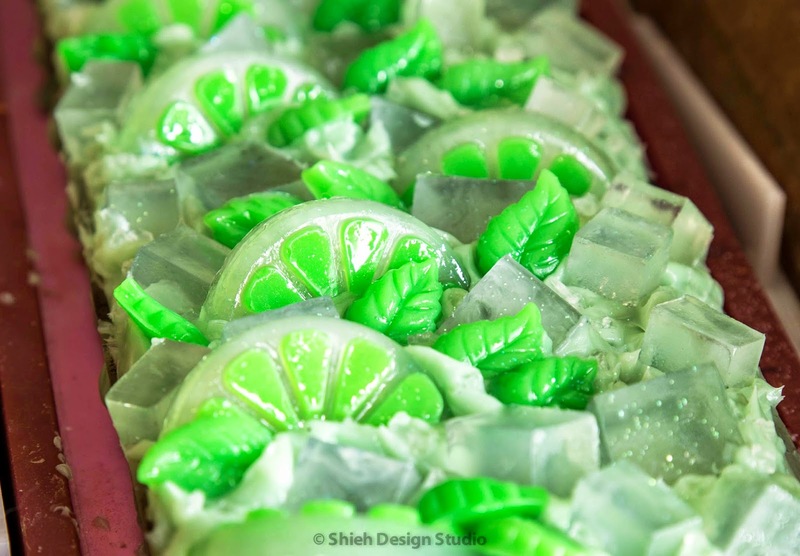 This is what you end up with, 6 cute melon wedges and left over green peel. You can apply this to coconut wedges or watermelon wedges and probably some more I can't think of. Have fun!